In a lot of city builder games, it can feel like your people are robots, mindless drones who do the bidding of an omnipresent mayor in the sky. The Colonists, a new city builder, simply makes that the case. 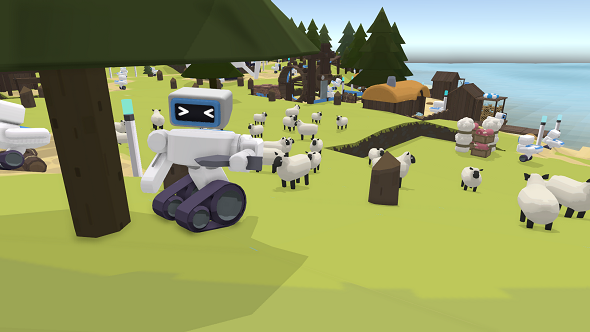 It’s a game where you prepare settlements for human inhabitants using a fleet of adorable Johnny 5 or WALL-E-esque robots. For more upcoming PC games, we’ve got a list to keep track. Coming to Steam Early Access in August 2017, it’s being developed by Codebyfire – a team consisting of one person, Richard Wallis – and published by Mode 7. There’s no trailer or Steam page for the game yet, but the official website is up. It promises a single-player campaign, free-play, and both competitive and co-op multiplayer. We’ll see how much of the game is already in place when it launches on Early Access, but if you want to get updates, they’ve got a mailing list over on their website. There’s also more screenshots over there – showing off some of the UI and tower-based defense. There are even some angry crossbow-wielding robots, because slanted eyebrows can show that anyone’s angry, even robots.